Height/weight: 5' 7 1/2" 250 lbs. Years traditional bowhunting: I started with trad gear as a kid and never strayed. (Gene Wensel)- I'm a handsome devil who has built his life around his passion for hunting with bows and arrows. (TG)- Any heroes or role models? (Gene Wensel)- People have a tendency to get those two terms confused. American youth often think of sports celebrities as "heroes." They can tell you how many illegitimate kids a quarterback has, what kind of car Michael Jordan drives or Shaq's shoe size but they don't have a clue about real heroes. Real heroes are often faces in the crowd or names on graves. My father-in-law took three bullets to his chest in WWII and lived to come home to gift me with my wife. He has a shoebox full of medals yet he doesn't talk about it. (Gene Wensel)- My dad killed a deer with a lemonwood longbow in 1953. My brother and I had bows even before that. Hunting with bows and arrows just became more and more a part of what I did and who I am thereafter. (TG)- Do you have any favorite memories or kills that stand out? (Gene Wensel)- My 2004 season was the best I will ever live. Not in numbers, but in memories. I killed the buck of 100 lifetimes after a lot of time and effort closing the deal. I was blessed with having it all come together with family and friends at the very end of the season, especially since there were a few dirtbags trying to poach this deer 24/7. Walking up to Woody was the high point in my bowhunting life. (TG)- Do you remember the first animal you took with a bow? (Gene Wensel)- The very first was most probably a tweety-bird. The first "big game" was a big old boar groundhog. I hit him right square in the eyeball with a target point and dropped him in his tracks. (Gene Wensel)- Preferences obviously change as we go along. What works for me might not work for others. I have settled on 58" takedown recurves. For years I shot 68-70#. I dropped to 60# about ten years ago and most recently shoot 56# @ 28". I believe good arrow flight and cut-on-contact broadheads out of a medium weight bow work better than heavier combos with poor arrow flight and/or bad shooting habits. I shot 2018 and 2020 aluminum shafts for years but just recently went to carbon arrows. They are hard to beat for durability, tolerances, flight and penetration and cost less in the long run. I have used a hip quiver that I sling across my chest for many years now. (TG)- What is the one piece of hunting advice you would give a new hunter? (Gene Wensel)- Always remember, bowhunting is supposed to be fun. Keep the fun in it. Start with a lighter bow with matched arrows, develop good shooting habits, limit your yardage and abide by your own self-imposed limitations. Practice regularly, hang out with people who know what they are doing and hunt good areas. With patience and confidence, its just a matter of time. (Gene Wensel)- Mature whitetail bucks. Although I must admit I've always wanted to whack a bunch of penguins. They can't run. They can't fly. They stand erect so neat with their big white chests pushed out just begging for an HTM blunt. Of course I would eat them all if I had a good recipe. (TG)- Do you prefer certain methods of hunting? (Gene Wensel)- As a rule of thumb, I'd say I usually prefer using the most effective legal means regardless of species, time, place or weather. For whitetails, that would be treestand hunting in November. (Gene Wensel)- My brother has been known to hunt once in a while. (TG)- Who got you started in traditional bowhunting? (Gene Wensel)- Howard Hill influenced my dad. Dad influenced Barry and I, then my brother and I grew to influence each other. (Gene Wensel)- Not really. I usually give and take things in life as they come along. I want to own just a little less rope than it takes to hang myself. (TG)- Do you make your own gear? (Gene Wensel)- I'm thinking more and more about one of those remote Australian gigs where you can just walk around and stalk wild pigs, buffalo, etc. Does Australia have penguins? That would seal the deal. 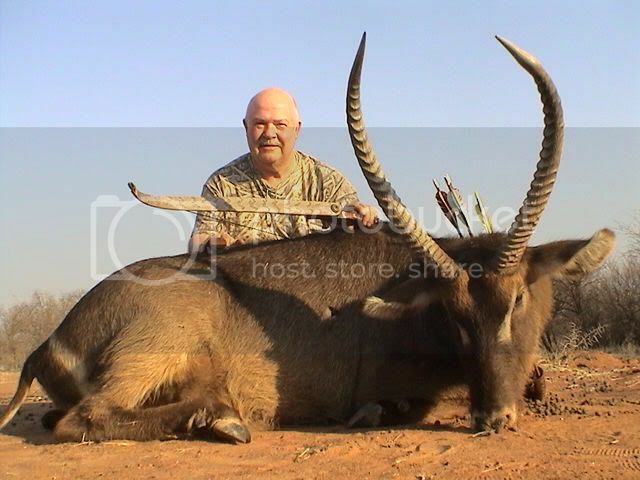 (Gene Wensel)- Due to supply and demand issues, I much prefer hunting private ground that isn't over-hunted or gunned. (TG)- Do you prefer evening, morning or mid-day hunting? (Gene Wensel)- Yes. Let me ask you something....do you prefer morning, evening or mid-day eating and breathing? (TG)- Do you normally use anything like cover scents, lures, camo or calls? (Gene Wensel)- I do all my calling with my own mouth. I use camo because I have so much of it. Regarding scents and lures, I use them at times but I pay more attention to wind direction than anything else. (Gene Wensel)- I have, but not during deer season. In reality, I think squirrels and groundhogs are the perfect small game species. Both are very underrated. (TG)- Tell us what your dream hunt would be? (Gene Wensel)- Probably a new species of big game in a far away place with close friends. (TG)- What’s the first thing Gene Wensel looks for when he hits a new area? (Gene Wensel)- An all-you-can-eat buffet. As far as deer hunting, I look for funnels, food sources, densities and drainages on aerial photos and go from there. (TG)- Which shoot do you like better, broadside or quartering away? (Gene Wensel)- I much prefer perfectly broadside. Quartering away too often gets only one lung. When I say perfectly broadside, I mean perfectly broadside. Even the slightest quartering to angle will send the arrow angling back too far. (TG)- What first tipped you off to Woody’s existence? (Gene Wensel)- I saw him at dawn one September morning in 2003 while scouting. (TG)- What its like to have a twin brother that shares the same passion for hunting that he does? (Gene Wensel)- Thats a hard question to answer, as I don't know what its like not to have my brother as my favorite hunting partner. Lots of guys have brothers who don't hunt. I can't relate to that, as I've never been there. Along the same lines, I think we all have favrite hunting partners who are brothers even though they are not related by blood. All of one's hunting partners are in fact family. (TG)- Can you tell us a little about your new venture in Texas? (Gene Wensel)- Barry and I used to sublease a portion of the King Ranch in south Texas for hogs, javelina and nilgai antelope annually in February for organized "fun hunts" every winter. When the King Ranch all but closed their gates except for guided hunts, we started looking elsewhere. We truly miss the opportunity to head south every winter. We are just finalizing negotiations on a huge ranch (80,000 acres) for hogs and javelina for organized groups to join us annually for our Cabin Fever Bowhunts. Watch for details soon on our www.brothersofthebow.com website. Unfortunately we couldn't close the deal on a place with nilgai, but this new ranch looks very promising. Hog and javelina opportunities are just plain fun. Both species are made for bows and arrows as far as I'm concerned. (TG)- Give us one good hunting tip that is outside the box. (Gene Wensel)- I really don't understand what "outside the box" means, but I'm going to make a statement that will probably piss some people off, which is outside the box as far as I'm concerned. I'm getting tired of people saying that quality bowhunting is getting to be a "rich man's sport." You get what you pay for in life. Quality opportunities are no longer free lunches. It sooner or later becomes a question of priorities. What is quality bowhunting worth to us monetarily or otherwise? That would be like saying flying is only for wealthy people. If a person has to travel cross country, one has the options of walking or hitching a ride (free), driving (more expensive) or flying (most expensive). Take your pick. Flying is not just for rich people. Supply and demand is what makes the world go round. If we expect good bowhunting for quality animals in under-hunted areas with no gun pressure, expect to pay for it one way or the other. In reality, free choice is the only free part about it anymore. Thats just the way it is with supply and demand. The answer becomes more of a question of how bad we want to do something, not whether we can afford it. I'd like to drive a Mercedes rather than a Ford but it'll never happen. On the other hand, if I wanted a Mercedes bad enough, I would sacrifice something else to make it happen. I'm not a rich man, but in many other ways I figure I've been blessed with wealth. (TG)- What is the biggest mistake the average guy makes picking a stand sight? (Gene Wensel)- I can think of three common mistakes right off the bat. Not hunting undisturbed deer, not looking for structure and funnels and not staying on stand long enough.